We Defeated Attacks on Workers Last Year, We Can Stop Them Again! Last year, you helped us defeat, SB 469, a major legislative assault on Georgia working families that would have criminalized free speech, eroded workers’ rights, placed undue burden on small businesses and strained already stretched public safety forces. Well, many of the extreme legislators that supported that bill are at it again. They’re trying to ram through, HB 361 & 362, bills that are almost identical to the legislative attacks from last year and another measure that would further hurt working families and local communities. The Georgia House of Representatives could pass these bills this week. We need to put pressure on our lawmakers to stop these dangerous measures. Click here now to tell your legislators to oppose these anti-worker, anti-community bills. Just like last year, right-wing legislators are pushing these new bills to appease their corporate donors. HB 361 is eerily similar to last year's bill. At its heart is an attempt to intimidate workers. But it goes far beyond that. It increases penalties for free speech activities, like picketing, puts new, burdensome requirements on small businesses and workers, and ties the hands of local governments from deciding what works best for them when dealing with their workforce. HB 362 is no better. It would restrict the ability of local communities to hire skilled, local workers for construction projects and open the door to contractors from out of state—many of whom would give big money to state politicians in return—to come into Georgia and make a quick buck using a less-skilled workforce. Stand with Fulton County Employees. Revitalizing the Voices of Domestic Workers. 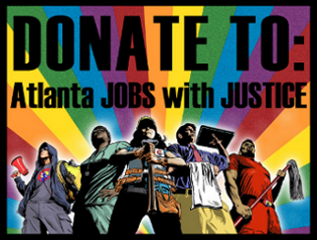 Jobs with Justice goes to India! General Strike Rolls Through India.